Hugo is a film by Martin Scorcese, based on the novel, The Invention of Hugo Cabret by Brian Selznick. Set in Paris during the 1920’s, it tells the story of Hugo (Asa Butterfield), who inhabits the Montparnasse train station in a manner similar to the way the Phantom inhabits the Paris Opera House. He keeps the clocks in the station running, a job that his missing uncle is supposed to be doing. He supports himself by stealing food and other goods from stores and cafes in the station. His life is made precarious by the presence of a Dickensian villain, Inspector Gustave (Sacha Baron Cohen), who want to put him in an orphanage. (Personal disclosure: as a film goer, I have a low tolerance level for Dickensian villains.) 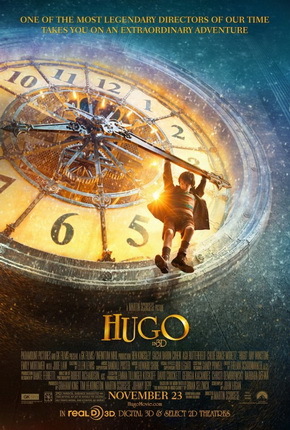 Hugo is caught stealing by Georges (Ben Kingsley), a toymaker who has a shop in the station. Georges makes Hugo work for him to make up for what he has stolen. Hugo meets Georges’s goddaughter, Isabella (Chloë Grace Moretz), and the two of them become friends. Through an elaborate series of events, Hugo and Isabella learn that Georges is actually Georges Méliès, the pioneering filmmaker whose works are now largely forgotten. Hugo and Isabella become determined to restore Georges’s reputation as an artist. This film is a fond tribute to Méliès, one of the first film directors, who began making movies in the 1890’s. Towards the end, there is a montage of scenes from Méliès’s films. Even in this jaded age of CGI effects, they are fascinating to watch. Méliès had a visual imagination that makes most modern directors seem anemic. He was also a great technical innovator. (Among other things, Méliès made the first color films. Each frame was tinted by hand.) He made 500 films, most of which have, alas, been lost. I hope that this film will encourage a new generation to discover his work. The film’s central conceit, that Méliès doesn’t want to be reminded of his past, is a bit thin and hard to believe. The main problem with this movie, however, is that at 126 minutes, it is too long. During the first half, the story unfolds with agonizing slowness, although the tempo does pick up during the second half. Also, the film is padded out with chase scenes that don’t advance the story, as well as numerous unfunny “funny” scenes featuring Inspector Gustave. (I know I’m not the only person who felt this way. The audience was mostly quiet during these scenes.) This character is played charmlessly by Baron Cohen, who at times seems to be doing an unsuccessful imitation of Peter Sellers as Inspector Clouseau. I would have liked this film better if there had been more scenes from Méliès’s films, and fewer scenes of Baron Cohen trying to be funny. This entry was posted on December 8, 2011 at 8:23 am and is filed under Cinema, France. You can follow any responses to this entry through the RSS 2.0 feed. You can leave a response, or trackback from your own site.